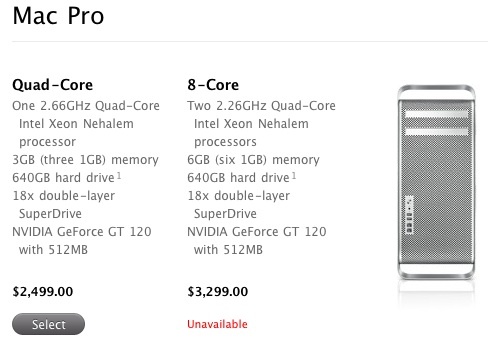 One MacRumors reader has pointed out to us that Apple's somewhat-hidden Reserve and Pick Up program is currently showing the company's Mac Pro models as "Unavailable" for reservation at his local retail store in Canada, possibly hinting at an imminent update. According to the tipster, the Mac Pro was seeing full availability for reservations at his store as recently as yesterday. 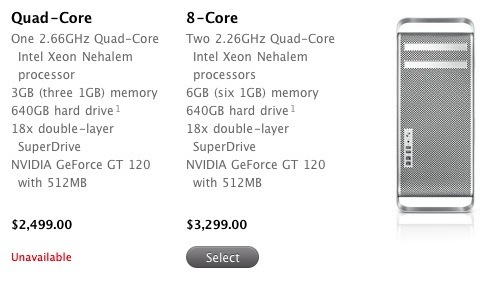 A quick check of the reservation systems for a handful of Apple retail stores around the United States shows a similar story, with some stores showing complete unavailability of Mac Pro reservations while others continue to offer either the base Quad-Core model or the 8-core model but not both. Apple's Mac Pro line is overdue for an update according to our Buyer's Guide tracking. A report earlier this year had claimed that a Mac Pro refresh was due "by June", but Apple failed to meet that rumored target. More recent claims of chip shortages for Intel's latest 6-core chips suggested that Apple might not be able push out a Mac Pro update until later this summer. As for other changes possible in a Mac Pro, evidence of support for several high-end graphics cards from ATI and NVIDIA have appeared in Mac OS X, and one report has pointed to the adoption of USB 3.0 and faster FireWire in the new machines. That report also suggested an "end of summer" timeframe for a release. Not all of Apple's sales channels are seeing constrained supplies of the Mac Pro, however, as the company's online stores continue to show shipping estimates of "within 24 hours" for both stock models. Just yesterday, a report indicated that Apple's iMac stocks are also running low, with third-party distribution channels seeing constrained shipments ahead of a supposed update to that line as well.